Royal Caribbean International’s Brilliance of the Seas made her maiden docking into Dubai, marking the company’s official entry into the Middle East earlier this year. One of Royal Caribbean International’s most outstanding ships, she will be making seven-night round-trip sailings to Muscat, Fujairah, Abu Dhabi and Bahrain from Dubai until April. Brilliance of the Seas is billed as one of the most elegant cruise ships in the world, featuring an open centrum with 10-deck- high windows and ocean-facing glass elevators, both of which will offer spectacular views of the passing shoreline and sea. 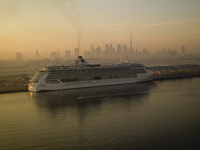 It boasts one of the highest space-per-guest ratios in the industry and will add more than 32,000 guests in the first four-month season to the region’s burgeoning cruise sector – which is expected to grow 30 per cent this year according to Dubai Department of Tourism and Commerce Marketing (DTCM). Michael Bayley, senior vice president International for Royal Caribbean Cruises says the arrival of Brilliance of the Seas is an important catalyst in driving forward regional cruise tourism growth and announced the ship’s 2011 return to Dubai following this year’s inaugural season. “The Middle East’s prospective growth figures for luxury cruising are remarkable and we expect Brilliance of the Seas to establish itself as the leading cruise option for years to come,” he said. Onboard, the ship features indoor and outdoor pools, the 836-sq-m Brilliance Fitness Centre and Day Spa, an indoor and outdoor sports deck with golf simulator, sports courts, a rock-climbing wall and a jogging track. It also boasts a wide range of dining options, with Arabian flavour added specially for the Gulf cruises, shopping arcades and a theatre. Brilliance of the Seas’ guests also will enjoy the cruise line’s award-winning Broadway-style musical revues from Royal Caribbean Productions in the Pacifica Theatre, complimentary Adventure Ocean kids and teen programming and Royal Caribbean’s Gold Anchor Service of friendly and engaging service from every staff and crew member. Royal Caribbean’s pre/post cruise packages and shore excursion programmes include four-wheel drive, travelling to sand dunes, majestic mountainsides, mosques and tranquil, picturesque villages. Cruise guests have opportunities to experience Dubai’s exciting tourism offerings at Dubailand’s key attractions including Dubai Autodrome in MotorCity, Dubai Outlet Mall in Outlet City, The Global Village, and Dubai Sports City which features the Ernie Els Golf Club, the Butch Harmon School of Golf and the Cricket Stadium – all sandwiched in between overnight stays in Dubai at the beginning and end of the cruise, where guests can take advantage of the destination’s sightseeing and shopping opportunities. Vacationers also can choose a four-night cruisetour extension for an 11-night Arabian adventure. For business travellers, Brilliance of the Seas offers numerous conference and meeting facilities. State-of-the-art fully equipped meeting rooms and Wi-Fi connections on board can accommodate large groups and charters too; whilst theatres and lounges are also available for corporate events of up to 1,000 people. There will be nine roundtrip sailings from January through to March 2011 and new for the 2011 season are two 12-night Dubai to India roundtrip sailings, departing on March 28 and April 9, which will include the ship’s maiden port calls at India’s Mumbai, Goa and Cochin.